So hi there. My name is Zero Dean. I was born in the tropical rainforests of South America and raised by monkeys. This might help explain a few things about me, but we’ll get to that *later. (*Probably won’t get to that later). Actually, I was raised by humans in Maine (the lobster state — because it looks like a lobster claw, duh!). If you don’t know much about geography — or you’re from somewhere outside of the USA (I’m big in Argentina!) — Maine is the northeastern-most state in the USA. What this means is that on a clear day, I could see *Europe from my roof. *Ok, I’ve been told that it probably was not Europe that I saw, but I’m telling you, I had really awesome vision as a kid. For what it’s worth, I don’t remember any of this — and quite frankly, this kid looks nothing like me! Anyway, this is my “about me” page (you can tell it’s mine because it has my name on it — Hey, just like my photos do!) — so I’m going to tell you a little about me and hope it doesn’t bore you to tears… or whatever it is you do when you’re, like, totally bored. Personally, I don’t cry when I’m bored — in fact, I don’t really get bored — but obviously some people do get bored… and then they cry. I’m not sure what that’s about. It has been said, on occasion, that I am difficult to describe. If you ask me, I think being “difficult to describe” is pretty awesome. To me, it means that I’ve succeeded in not being easily defined by “what I do for a living” or a particular activity I enjoy. I never really wanted to be represented as just a “label” — of course, I don’t think anyone ever does — except maybe “rocket scientists”. But sadly, I’m not a “rocket scientist”. I’m not even a bottle rocket scientist. Or a scientist of any kind, really, but we’re getting off the subject! So yeah — I think being difficult to sum up is a good thing — so that’s something I try to maintain as a way of life. And — TADA! — we’re done. That’s all there is to know about me! 1. Have a number for a name. Seriously. If you don’t have a number for a name, get one! They rock! — Just don’t pick one that’s already taken! Like, for example, my name. You can’t have it. Get your own! 2. Be fascinated by everything. (We were talking about how to become difficult to describe, if you forgot already). But come on, how could you not be fascinated by everything? Anyway… I should tell you that people will catch on to your “unpredictableness” and begin to predict that you will do unpredictable things and make unpredictable sandwiches decisions, but even so, they’ll still be surprised by the outcome. There are two rules to success in life. Photography: I like to take pictures that tell stories. Capturing “magic” is my favorite — it’s what I try to do. Writing: I like to write stuff that affects people — makes them think, laugh, or takes them places. Travel & Exploration: I like exploring the world to expand my perspective, satisfy my curiosity, and *meet chicks (probably not meet chicks). I mean, don’t get me wrong, I like chicks (but I don’t really call them chicks — this text, notwithstanding), but I’m kind of nerdy and wordy and stuff. And quite frankly, I ain’t got no game. And heck — while I’m in the confession booth — I can’t dance either. Adventure: I like facing my fears and living outside my comfort zone. Well, as much as someone can actually “like” being uncomfortable. What I really like are nuggets of wisdom — or chocolate. At least I hope that’s chocolate. Digital Art: I enjoy creating things on the computer. I’m kind of a nerd *that way (*and other ways). Being a ninja: Being a ninja requires no explanation! THE END. THIS TIME I’M SERIOUS. STOP READING. 3D/CG: Formerly worked in the computer gaming industry making art for video games like Red Dead Redemption (Game of the Year 2010) and Rise of Nations (Game of the Year 2004). 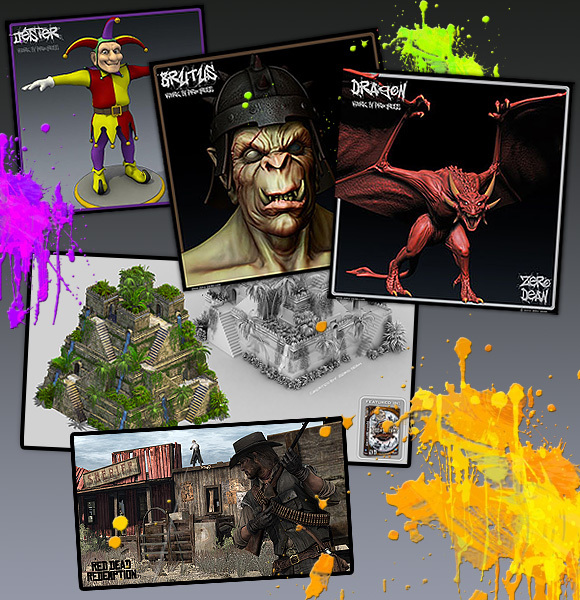 Specifically, I specialized in modeling and texturing architecture and environments using software like 3D Studio Max, Maya, ZBrush, and Photoshop. Full-time photographer: I had a photography studio in the Baltimore/DC area before moving to Los Angeles to play a supporting role in the entertainment industry (actor headshots, model portfolios). Sponsored instructor: And once upon a time, I used to get paid to learn software and then teach it to college students and faculty. I spent a fortune bribing someone to let me do that (and all I got was this lousy t-shirt! ).